Mmmmm a hard creamy toffee, with a delicious lasting flavour. 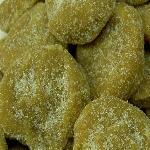 A sour toffee covered in a dusted icing sugar with an apple taste, hence the name Apple Bon Bons. Remember these? The name given years ago was 'Marzipan' Teacakes. Covered in sugar with pieces of coconut dipped in creamy toffee. Certainly one that is at the top of the favourites list. A delicious creamy toffee covered in milk chocolate made by Walkers. Firm in texture. 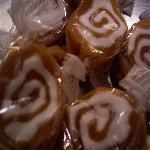 Jamiesons milk chocolate toffees are a creamy softer toffee. Walkers treacle toffee is a firm creamy toffee which is very popular. Why not try the milk chocolate or plain toffees too.